The suspect, Mawusi Rose Fianko, 42, who claims to be a seamstress, had shaved off the hair of the one-year-old boy. It's believed she was trying to conceal the baby's identity. 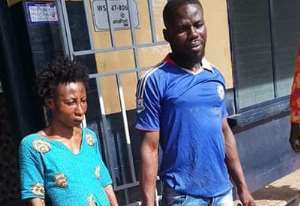 She was arrested together with her boyfriend and 'accomplice', Lawson Lartey, 33, at about 12am on Tuesday at their hideout at Effiakuma in the Effia-Kwesimintsim Municipality of the Western Region. According to the mother of the baby, Nana Akosua Bowaa, her baby had bushy hair at the time he was stolen last Friday, and was extremely surprised to see the hair shaved off. In a brief interview with journalists on Tuesday dawn after the baby was reunited with the family, Akosua Bowaa said she had learnt her lessons and would never leave her child in the hands of strangers again. DSP Olivia Ewurabena Adiku, Western Regional Police Public Relations Officer (PRO), told DAILY GUIDE that the police had information that the suspect had been spotted near Effiakuma. “So the police mounted surveillance in the area around 7pm and 12am and we were able to get the suspect,” DSP Adiku said. She disclosed that when the police got to the hideout of the suspects, they gathered that Mawusi Rose Fianko was absent. DSP Adiku said the suspect later met the police officers at the entrance and tried to deny that there was a baby in the room but they pushed her aside, forcibly opened the door and mounted a search for the baby. The police, she said, found the baby boy with the suspect's boyfriend. “The police were able to rescue the baby and later reunited him with his family,” the Police PRO said. She said before handing him over to the mother, the police conveyed the baby to the hospital for medical examination. When asked about the motive of the suspect, the Police PRO said Mawusi Rose Fianko and her boyfriend were yet to write their statements for proper investigations to commence. She, however, pointed out that the two would soon be put before court on the charge of child stealing. When the news of the arrest of the suspects reached traders at the Takoradi Market Circle, they moved to the Takoradi Police Station in their numbers to catch a glimpse of the woman and her boyfriend. The suspect managed to steal the one-year-old baby boy from his mother at about 4:30pm in front of the Market Circle Post Office in Takoradi last Friday. The suspect initially posed as a customer and reportedly asked the mother to allow her handle her two kids to enable her to serve the customers better. Fortunately, a closed circuit television (CCTV) camera of some banks in the area captured the woman, who was cuddling the baby as she moved away from the market.